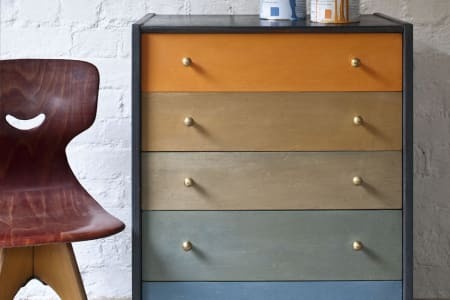 Learn to upcycle furniture using Chalk Paint™ using basic techniques from paint distressing to gilding and everything inbetween in an informal and relaxed environment under the supervision of an instructor trained by Annie Sloan herself. 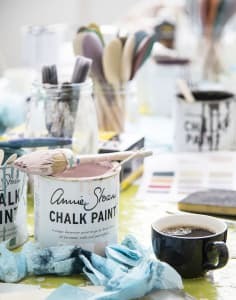 Would recommend this course to anyone who would like to familiarize themselves with Annie Sloan Chalk Paint and the different techniques applying these paints to..well almost any material you can think of..but in this case to pieces of board only (so no actual upcycling of furniture) Absolutely no prior experience needed, it really is a beginners course. The tutor Lucy Giles was very kind and knowledgeable. She very thoroughly explained and demonstrated the 6 different techniques and asked us regularly if everything was clear or if we had any additional questions. All the materials for the course were generously provided: pieces board, different colours paint, 3 different kind of wax, brushes, gloves, pieces of cloth, sandpaper, glue & gold foil. We were really encouraged to try different things with different colours and to experiment which was super fun. And liked that we could keep the pieces of board and a folder with information about the paints and take that home. This workshop was a gift for my girlfriend’s birthday and I booked a place for myself as well. I’m glad that I did - it was an enjoyable morning with a lovely group. Lucy showed us six different paint techniques and gave us plenty of time to try them out. Would recommend! Lucy was a great teacher - fun and knowledgeable with loads useful tips for painting and restoring furniture - I feel inspired and equipped to get started transforming various pieces of furniture around the house. The venue was lovely and light and the pastries and coffee (roasted onsite!) were delicious. I had a wonderful time attending the Beginners Annie Sloan Paint Workshop. The session was delivered by an informed practitioner who was great at engaging the group as well as assisting with individual queries. We were thoughtfully introduced to the basic skills such as paint distressing, gilding and crackling which has help me begin the process of transforming my home.Thank you Rigby & Mac. I will be recommending the workshop to others and would be interested in attending the Advanced Annie Sloan Paint Workshop. We learned and practised 6 techniques including distressing, gilding and crackling, using the Annie Sloan chalk paints on various wood offcuts. The techniques are pretty straightforward but it was useful to have a range of colours available to experiment with and to be able to take the results home afterwards, especially if you already have a project in mind.